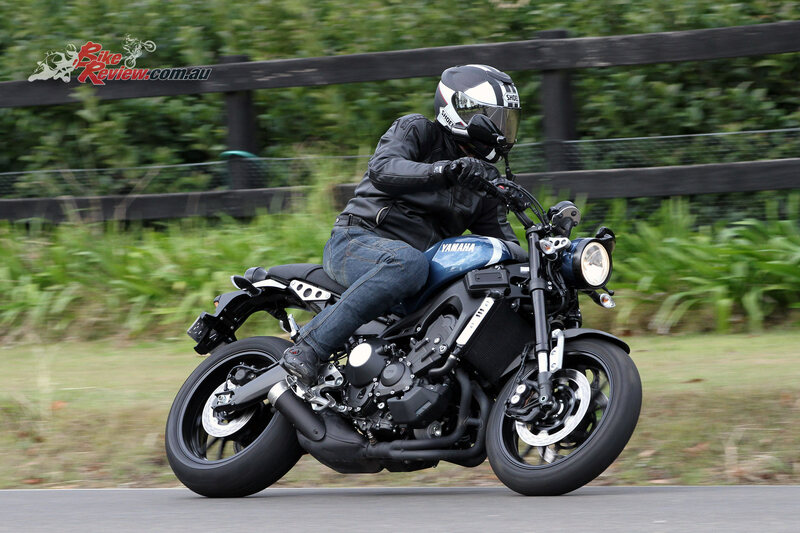 If there was ever a case of looks can be deceiving, then the Yamaha XSR900 is it. 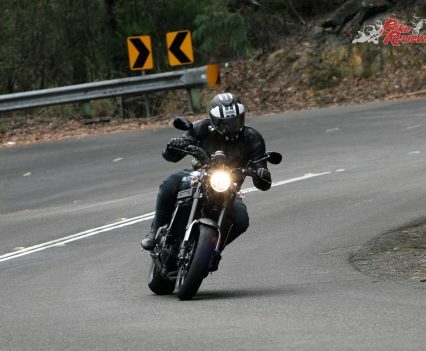 I’ll be honest, the style of the XSR is not really my cup of tea and it was not on my wish list of bikes I must test ride, but after only a few hundred meters up the road I’m glad I did the review. It’s fantastic. 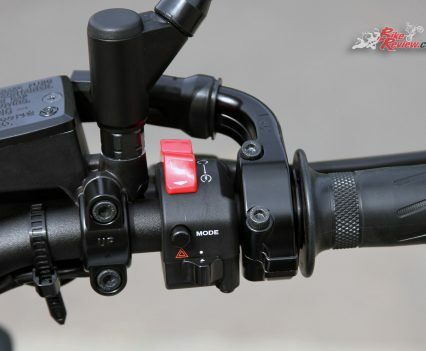 Looking around the bike, I like some of the feature and details, such as the easy to read and operate dash. It may look a bit odd stuck up in the air, but it’s simple, functional and has everything from a gear indicator to a fuel gauge and even tells me it’s a nippy 12ºC I’m about to ride in. There’s no denying it’s a well put together bike, with nice paintwork that incorporates brushed alloy stripes on the tank and great welds on the frame and swingarm. 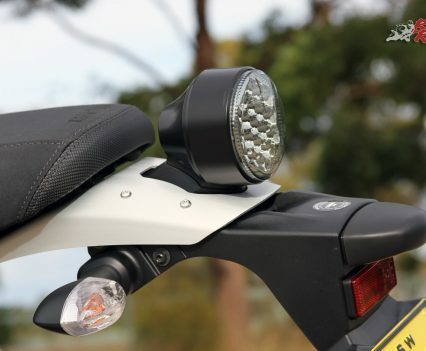 One thing I don’t like is the back light, it’s like Yamaha forgot to incorporate a light into the rear tail unit and bolted this one on as an afterthought. 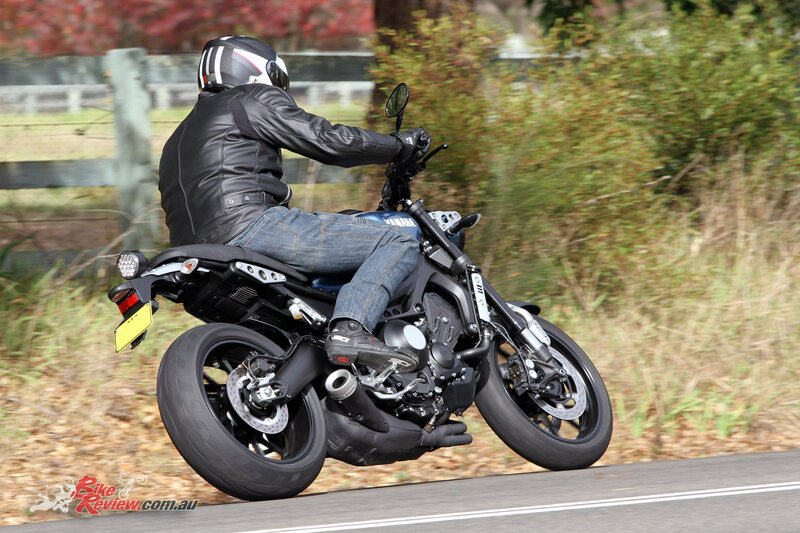 The exhaust however is a thing of beauty; the short stumpy muffler really opens up the swingarm and gives the bike a sportier stance. 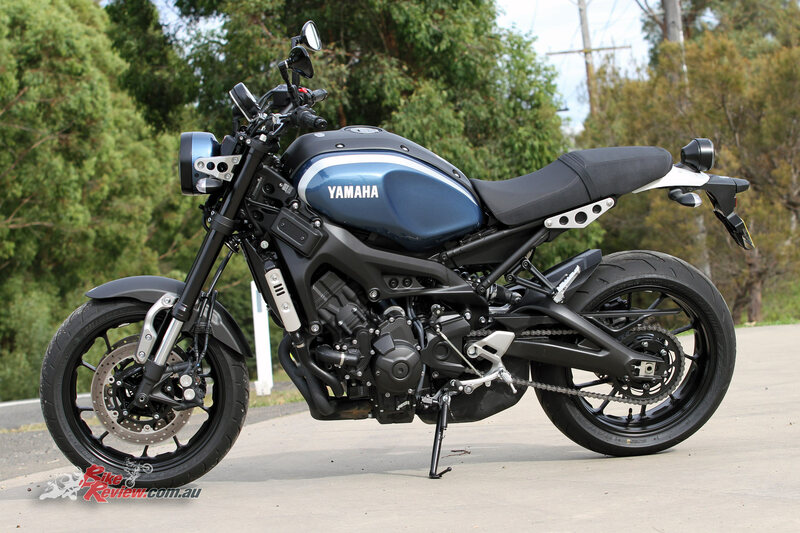 All up a nice bike that reminds me of my current new project, a Yamaha RD350LC. On a twisty road, the XSR is at home and feels really light and more sporty than its looks would suggest. The gearbox is spot-on and has a light feel at the lever with an assisted slipper clutch to stop rear wheel lock-up on down shifts. The front suspension feels a bit on the soft side, but I don’t mind a softer sprung bike and it’s still capable of surprising a sportsbike or two in the right hands. The ergonomics are just right for me and the seat is the best I’ve sat in for a while, you could really clock up massive kilometers in comfort on the XSR, or just use it for your daily commute or take it for a scratch down your local twisty road – the choice is yours. 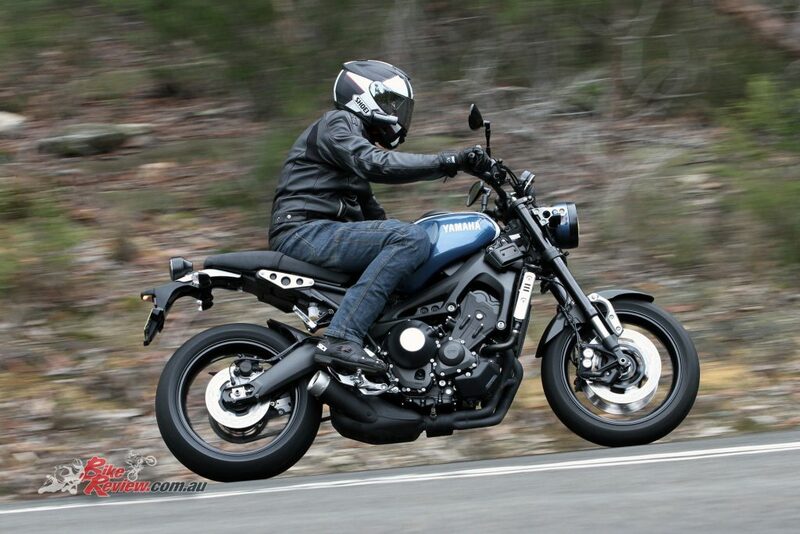 Despite basic suspension the XSR handles well and improved over the previous MT-09 from 2015, which it is based on. This is through revised seating position, springs and valving. 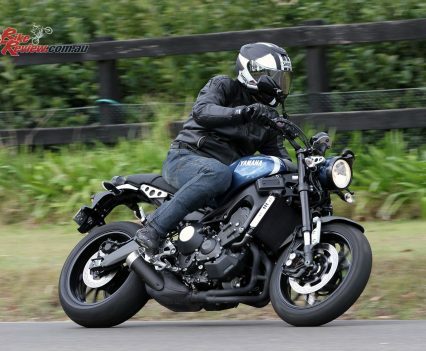 The XSR comes with three map modes A, Std and B. Flicking between modes I find B is super smooth and would be my mode of choice in traffic and any wet conditions, it reduces power lower down in the rev-range and smooths the throttle out so much, taking away any hint of on-off throttle snatching. 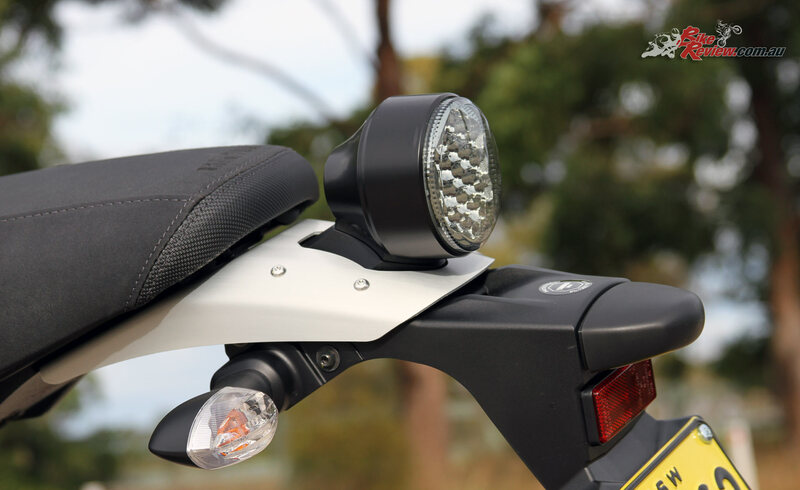 On the other hand A mode gives you full power and sharpens the throttle response. This mode is fun to ride in, but it just feels a bit too “light switch” off and on for me. For me Standard mode is the best, the throttle response is slightly smoother and you still get full power making it easy to feed in those ponies in a safe predictable way and also makes doing wheelies a breeze. I’m a big fan of triples and Yamaha’s 900 is right up there with the best of them, the engine is a belter and has plenty of pulling power at seemingly any revs. The traction control is good, with three levels, and can be switched off for wheelies. The ABS is also fantastic. 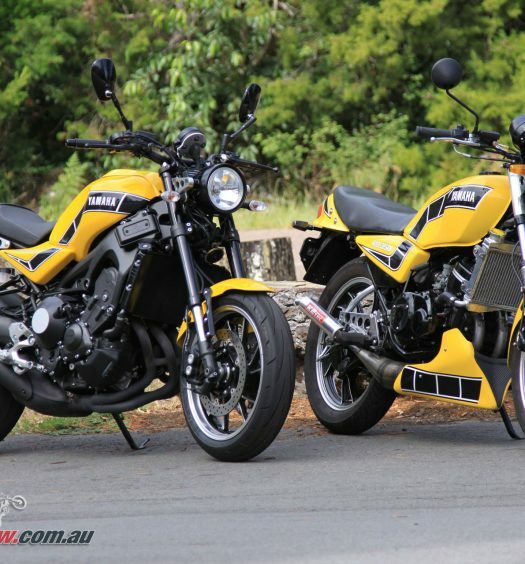 The XSR is based on the old MT09, which is a good fun bike and very affordable; however, it does have its flaws. 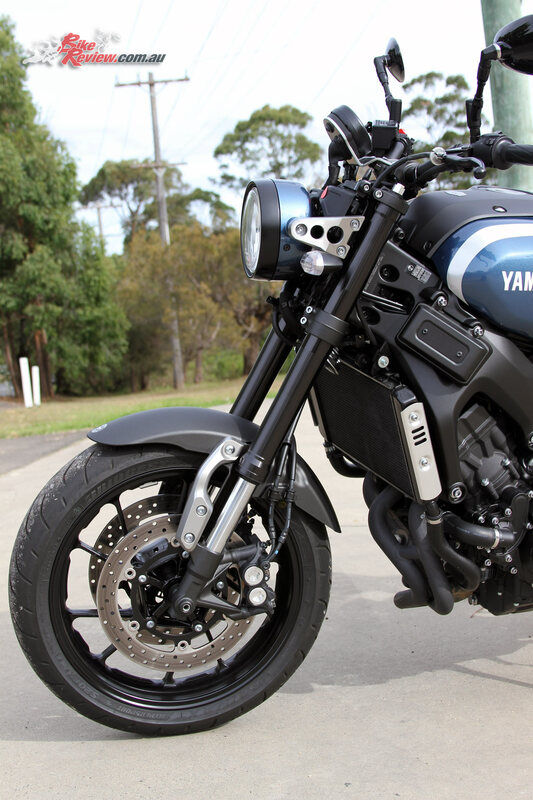 The XSR address all of them in a retro package. The fuelling is now spot on depending which is your map preference, the suspension is better with the use of different springs and valving – although not perfect. 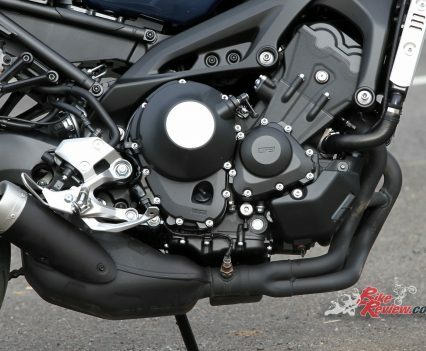 Featuring a bore and stroke of 78mm x 59.1mm to give a displacement of 847cc, the four-stroke DOHC four-valve engine straight from the first generation MT-09 runs with a compression ratio of 11.5:1. Intake valve diameter is 31mm, while exhaust valve diameter is 25mm, and by setting the valves at a narrow angle of only 26.5 degrees, engineers have been able to keep the combustion chambers ultra-compact for quicker combustion processes and higher torque output. Forged aluminium pistons are fitted with fracture split (FS) conrods and the 78mm diameter pistons run in direct-plated cylinders, which ensure effective heat dissipation. 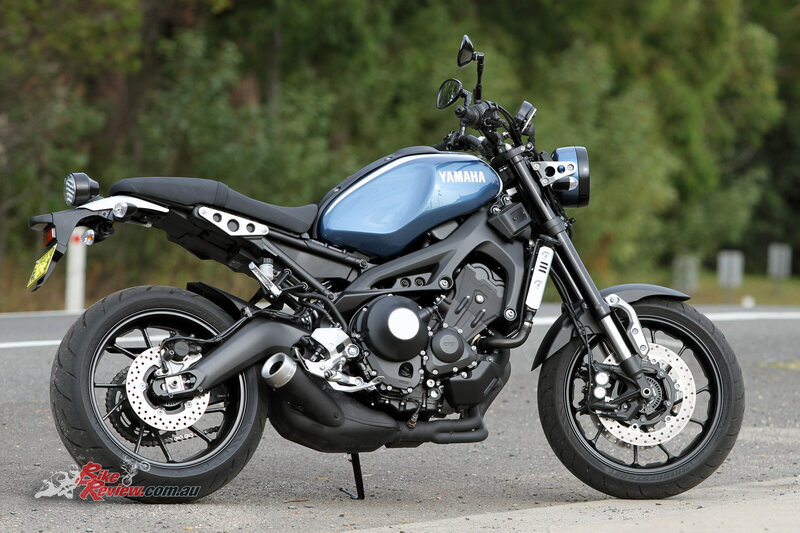 The XSR900 is also significant for the fact that it is the first multi-cylinder production Yamaha motorcycle to utilize an offset cylinder design. The 120º crank delivers a regularly-spaced firing sequence at 0º, 240º and 480º, and it is these even firing intervals that ensure a linear delivery together. 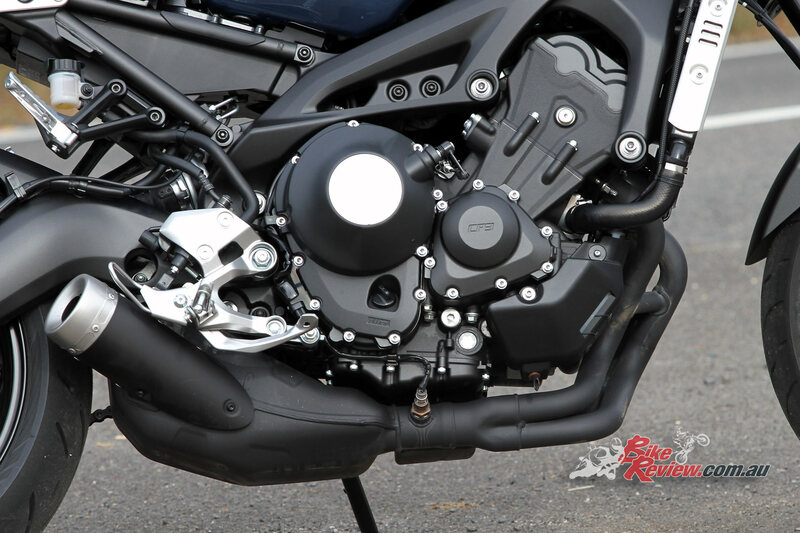 Compared to an in-line four-cylinder with a 180º crank, the XSR’s 3-cylinder powerplant transmits a stronger feeling of combustion torque to the rider because its combustion torque waves and composite torque waves are virtually identical. To minimize unwanted vibration while still allowing riders to enjoy the engine’s strong power pulses, the powerplant is equipped with a primary coupled-force counter rotating balancer. 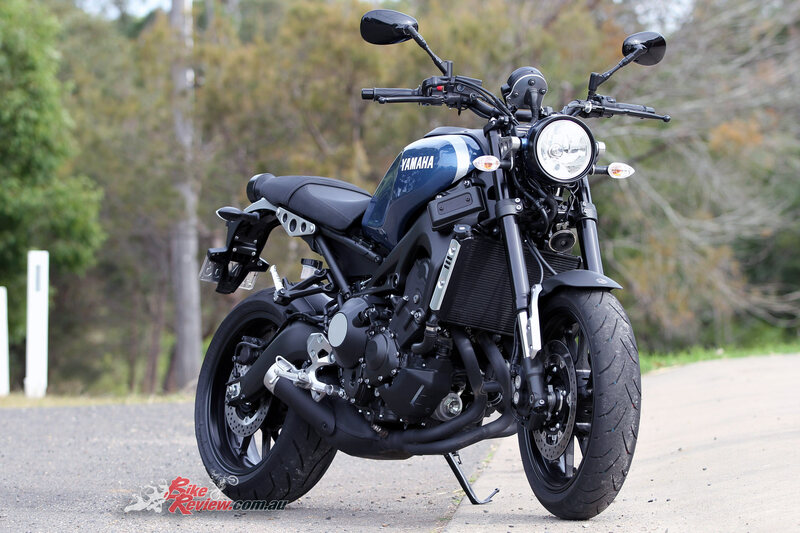 To handle the wave of low to mid-range torque, the XSR runs with a relatively high primary reduction ratio of 1.708. 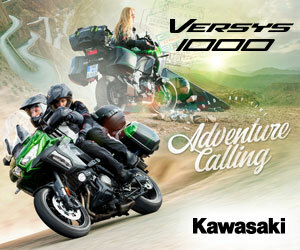 Yamaha’s designers have also focused their efforts on space efficiency and the new transmission is very compact. 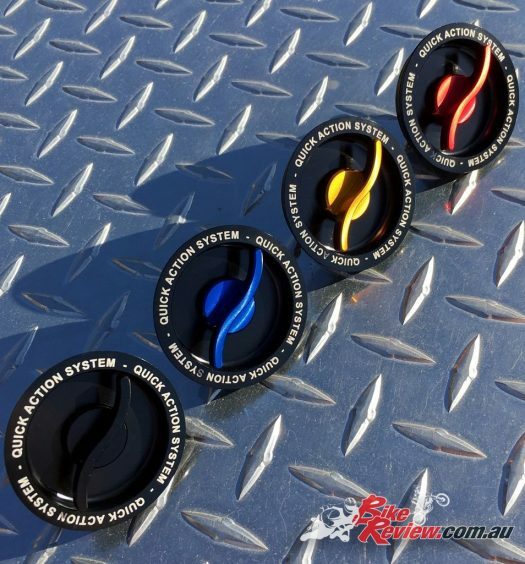 The EFI system features twelve-hole injectors designed to deliver an atomized fuel spray with a droplet size of only a few microns. These injectors are attached directly to the cylinder-head, a design that ensures the highly precise injection of fuel directly at the valve skirt to give good fuel efficiency. An added advantage of positioning the injectors directly onto the head is that it allows the use of shorter throttle-bodies, which contribute towards achieving high rpm intake efficiency. Another feature, which is designed to enhance the engine’s strong torque characteristics, is the downdraft intake system, which utilizes three intake funnels of unequal length. 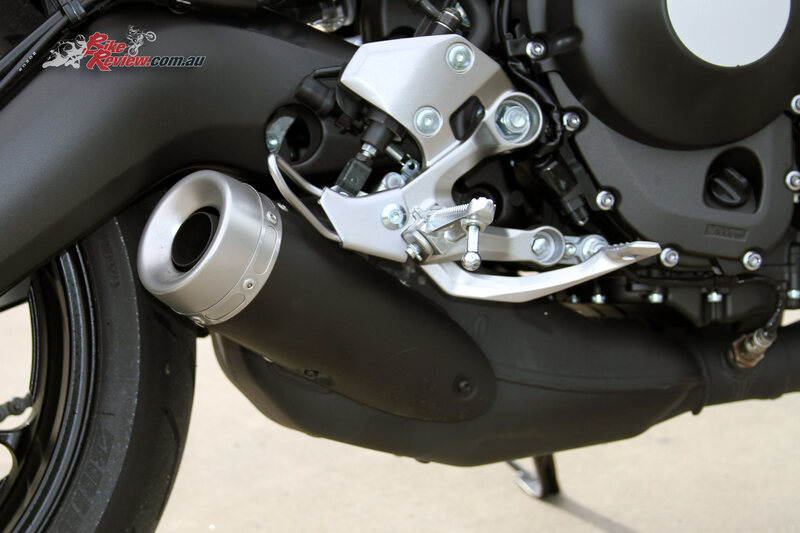 The first funnel is 102.8mm long, the second is 82.8mm and the third is 122.8mm, and these different intake passage lengths create slightly different conditions in each cylinder to create complementary power and torque curves. 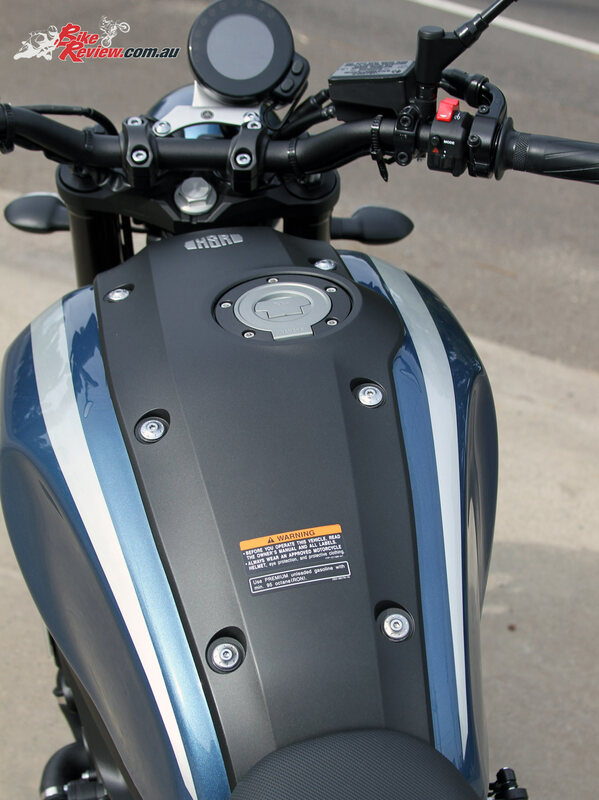 The XSR900 is fitted with an integrated single-piece 3-into-1 exhaust system and short muffler featuring three internal expansion chambers. 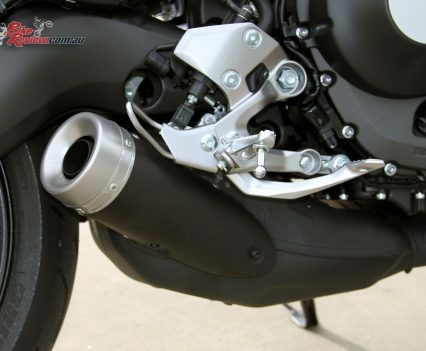 To achieve a strong exhaust pulse effect, the three stainless steel exhaust pipes feature connecting tubes between pipes 1 and 2, and between pipes 2 and 3 – and the pipes are also treated with a Nanofilm coating that helps to keep the system looking factory-fresh by preventing discolouration, rust and stains. 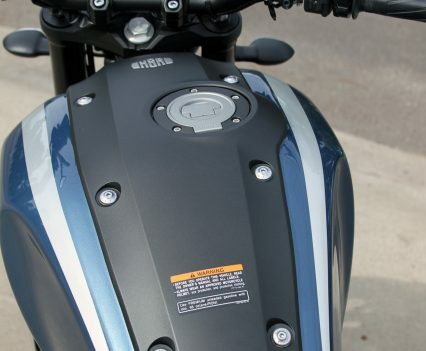 A specially-designed oil pan enables the three exhausts to run tightly against the engine to give a deep banking angle of 51º, allowing the XSR900 rider to enjoy supersport-levels of cornering performance. The irregular shape of the pan – which tapers towards the base – also helps to reduce surface fluctuations and bubble formation in the oil during sudden machine movements, which helps ensure effective lubrication. 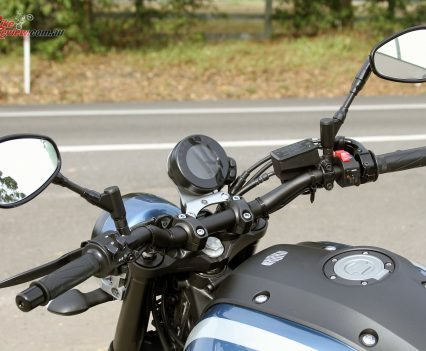 The Yamaha Chip Controlled Throttle (YCC-T) is derived from the YZF-R series models. 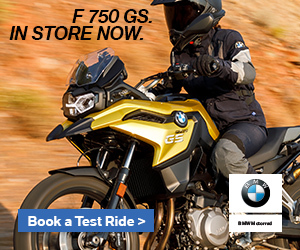 This ‘fly-by-wire’ system senses every throttle action made by the rider, and the ECU instantaneously actuates the throttle valve to give an immediate engine response and allows the three stage plus off traction control system. 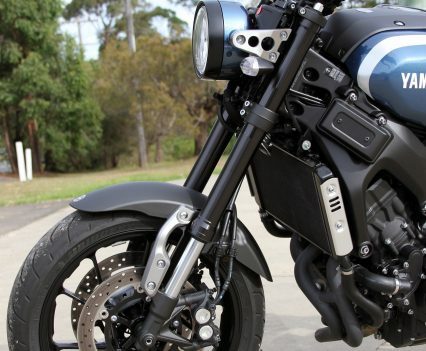 The XSR chassis is a control filled aluminium die-cast unit that is split into halves and bolted together at the headstock and rear pivot point. 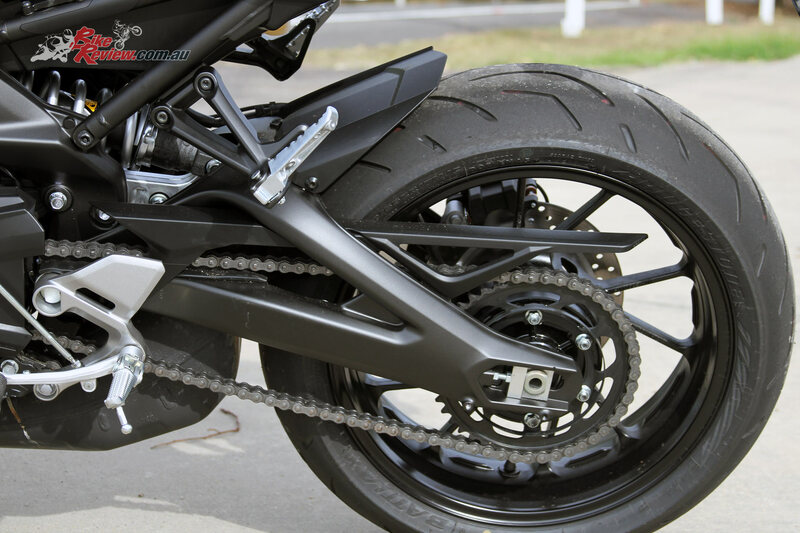 This gives a weight saving of over 10kg when compared to regular techniques, such as with the old FZ8. 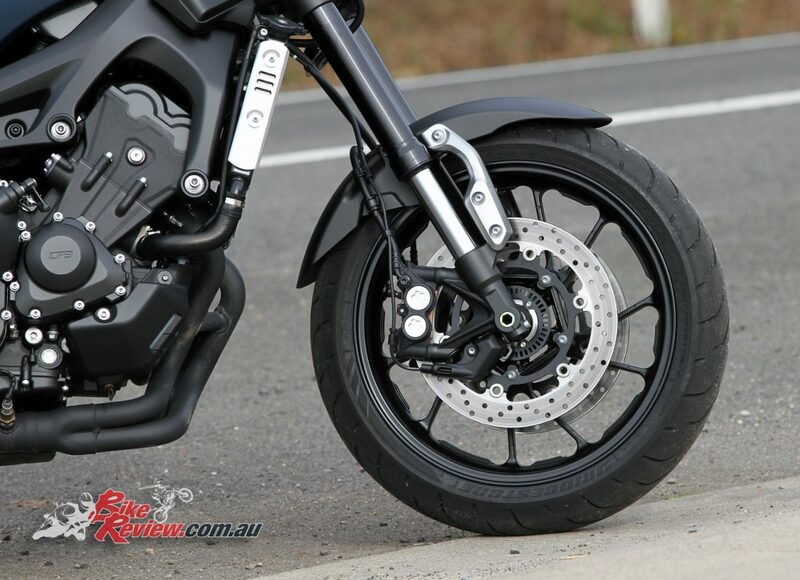 The swingarm is also CF aluminium die-cast, with the two sides welded together. 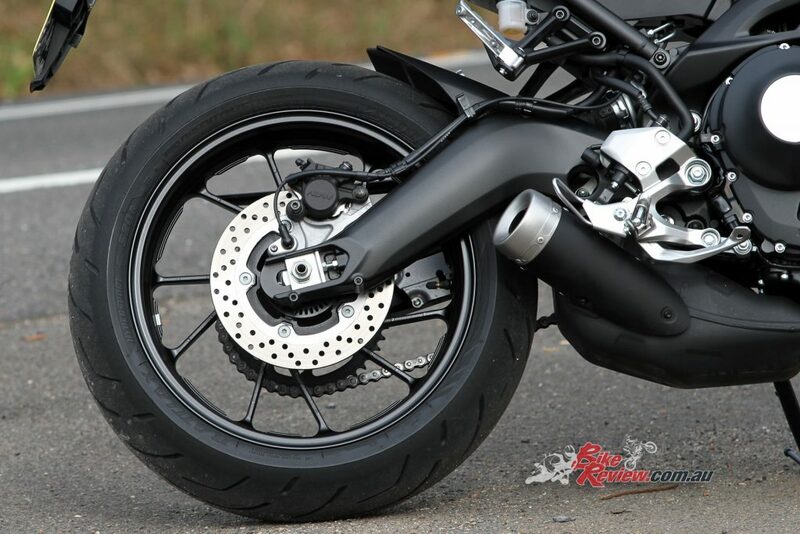 The swingarm pivot, interestingly, is on the outside of the frame, making the frame and footpeg span narrow for better ground clearance and comfort. 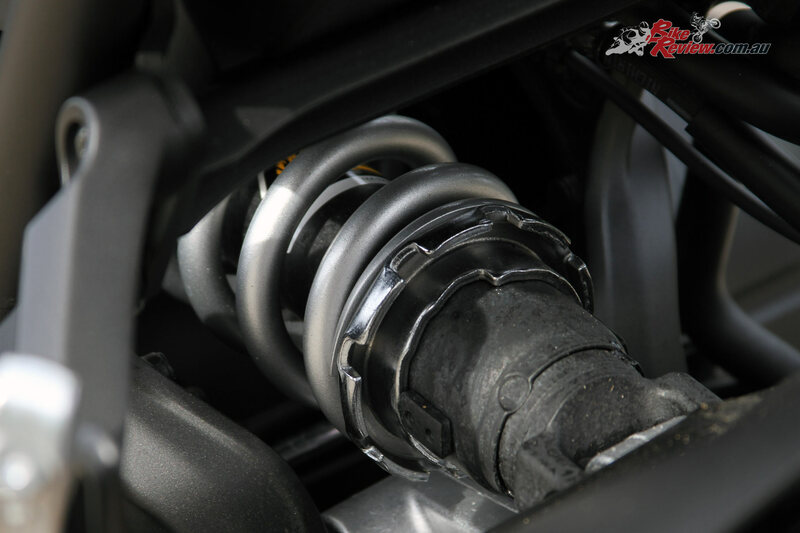 The suspension on the XSR900 is basic, only offering rebound adjustment on the front and only rebound and preload on the rear. 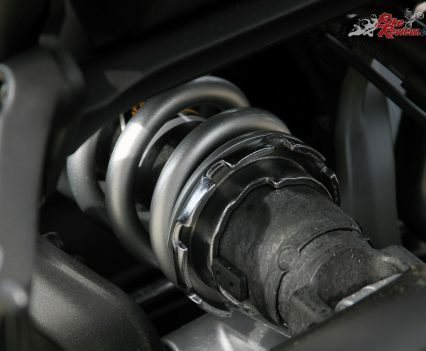 The forks are 41mm inverted and held in place by a forged lower and cast upper triple-clamp. 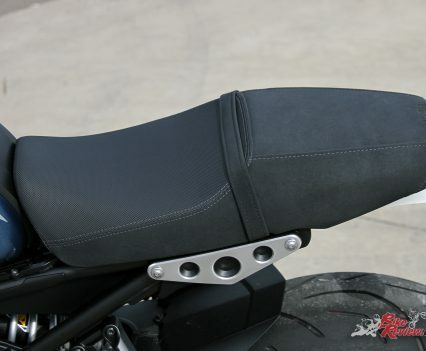 The shock is house in a horizontal position beneath the seat contributing to the bike’s centralisation of mass. 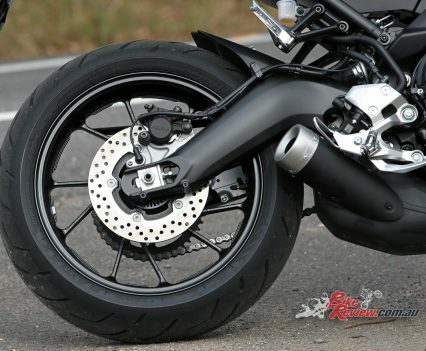 Braking is ABS equipped and by 298mm floating stainless steel rotors and radial-mount four-piston calipers. Sintered pads are fitted standard and the rear disc is a 245mm unit with a pin-slide caliper. 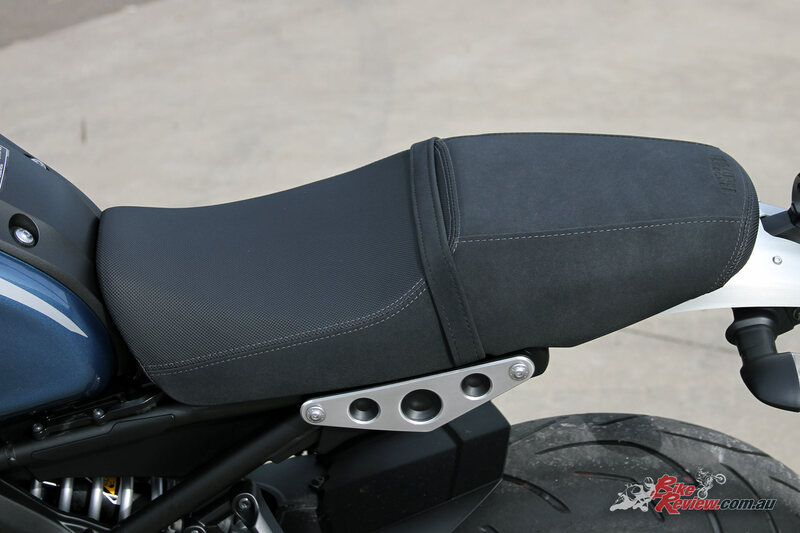 The 14L fuel tank features deep knee recesses and stylish curves. 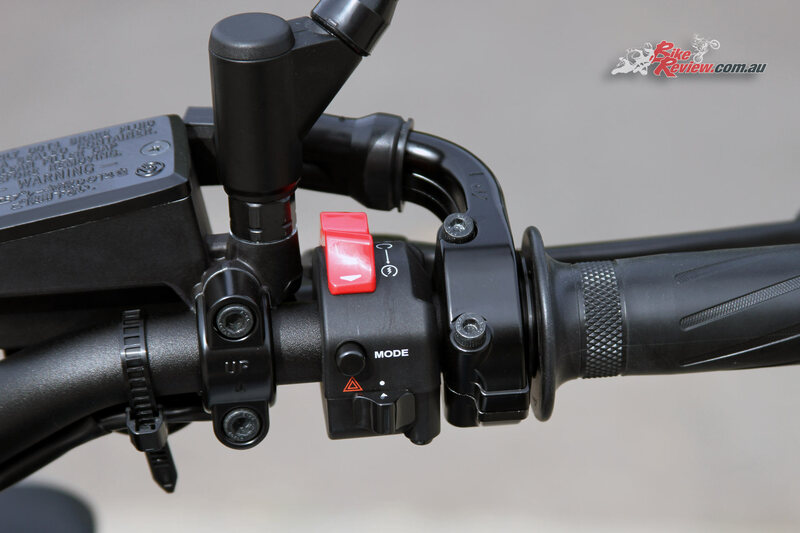 The ‘bars are tapered cast alloy and feature a new slide type starter switch that incorporates the kill switch. 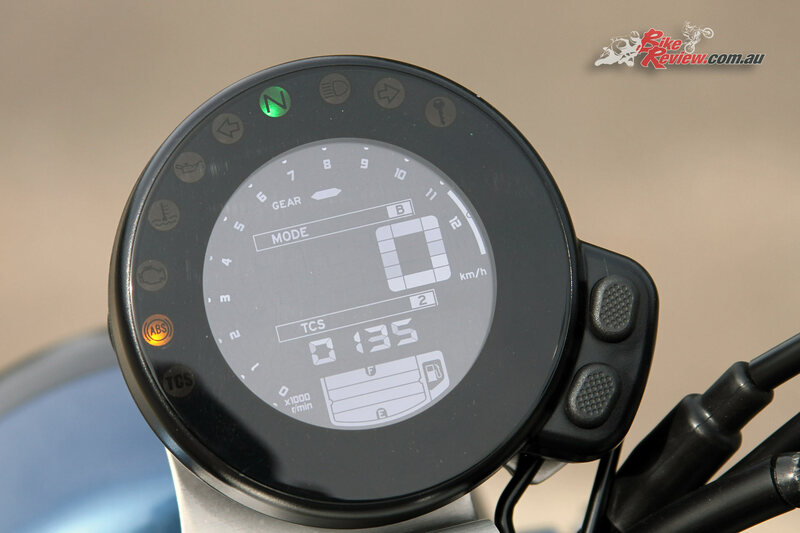 The cafe racer style LCD display includes a gear position sensor as well as tacho and speedo. 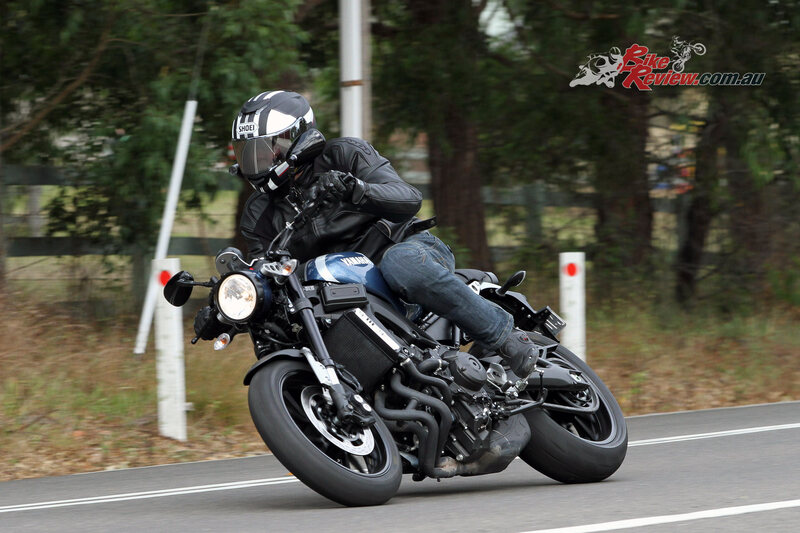 I recently rode the Yamaha XSR900 at Sydney Motorsport Park. I booked into the medium fast group and as I lined up I noticed something unnerving – pretty much most of the bikes were large capacity superbikes with very few nakedbikes. I looked out of place and most likely to get hosed. I left the XSR in A-ggressive mode and went out to have some fun. The engine is ballistic and the hero of the package. 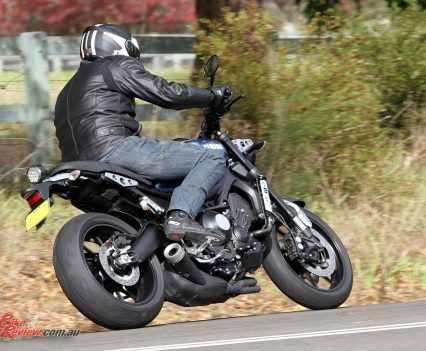 The intake noise is angry and the exhaust note is intoxicating – it has a racebike tinny resonance and I’m loving it. The power and torque the triple makes is very impressive and I’m easily keeping up. The front brakes are powerful and have great feel and the ABS no hint of lock-up under hard aggressive braking so the calibration is spot-on. The rear ABS does kick/pulse the lever a few times but only when I was braking harder than really needed. 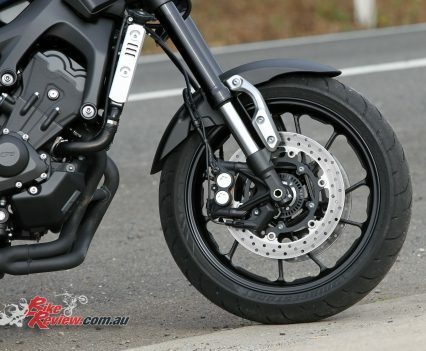 The slipper clutch works really well too – even under the hardest braking there is absolutely no chatter at all and the downshifts are silky smooth. On the other hand the upshifts at higher speeds and gears are slightly notchier. I tucked down and managed to get up to 240km/h down the straight. The bike was very stable even with the wind buffeting. 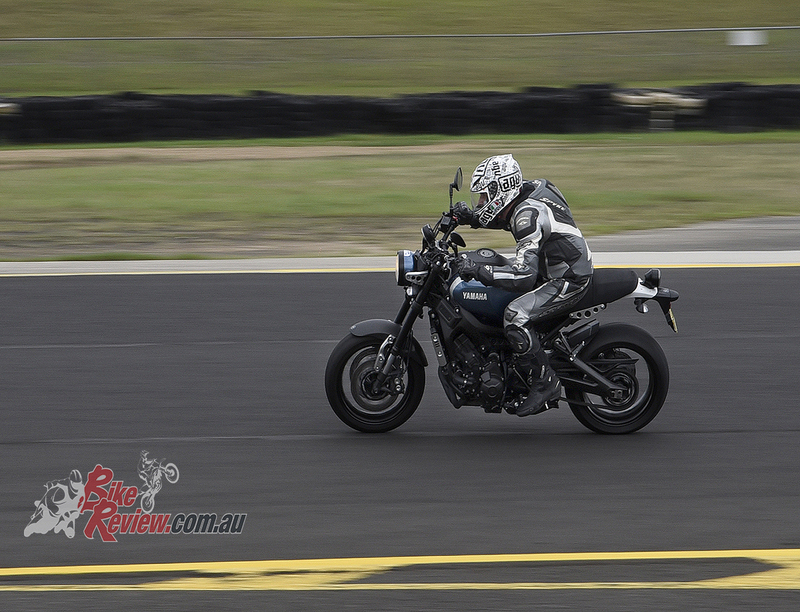 Peeling into turn one at anything over 200km/h the bike was wallowing too much before it settled nearing the apex. It would not want to turn and there was not a lot of feel from the front tyre. Once it had settled and approached the apex it was fine and would fire out like a missile. It was frustrating as the fast guys would buzz straight past me from turn-in to apex but once past that the XSR would fire out of corners and stay with them until the next corner where they would edge away again. It was worse in corners where I was trail braking harder too. I had to be smooth and trust the front-end. I feel that the rear was bang on but the front maybe too soft making the bike pitch at turn-in and and settle when off the brakes again. The rear was just perfect hooking up on exit with a hint of wheelspin thanks to the traction control which I set to low. 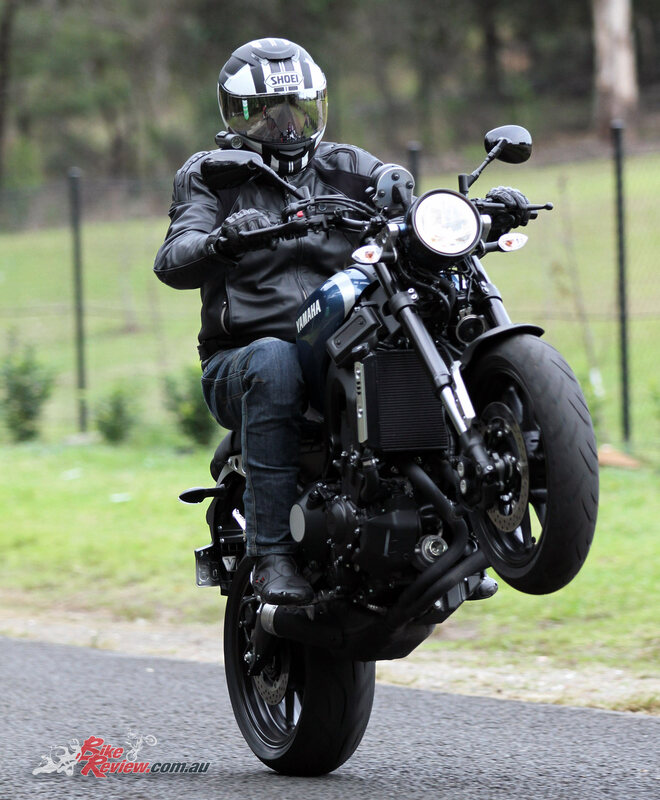 The XSR would also lift the front wheel creating a massive grin. 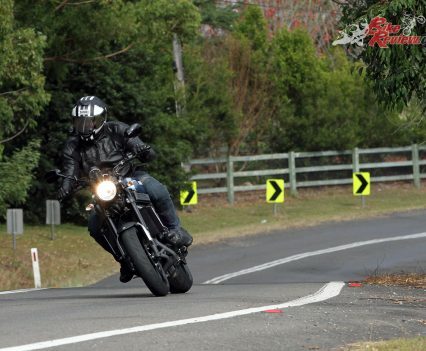 I have to pinch myself really as I’m riding a cafe racer not a sportsbike. 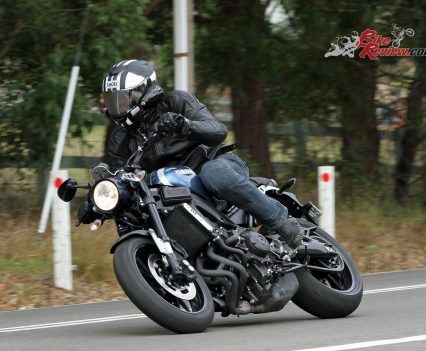 I can’t imagine how much better the XSR would have been if the front end was set-up well. 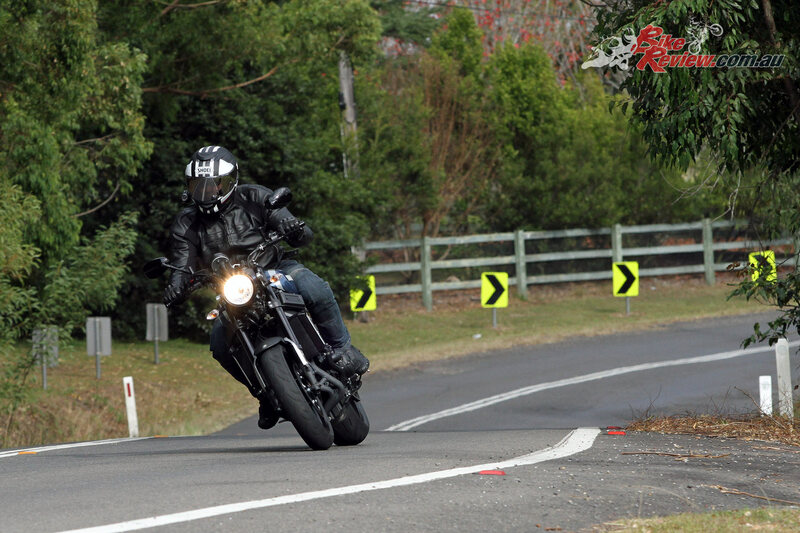 The bars, footpegs, switchgear are all very well placed and the bike is quite comfy. 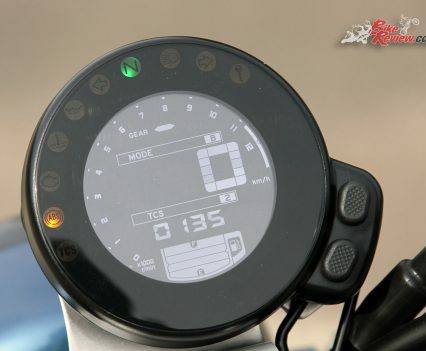 I really like the dash as it’s very easy to read and has a nice and simple design that suits the retro cafe racer look. It’s a nicely designed bike from top to bottom and the only thing I would do is paint all the aluminium billet pieces black for a meaner look and add the aftermarket seat cowl and a larger chromed front light as it looks slightly out of proportion. After that I would play with the forks and maybe try different hoops for more front end feel. 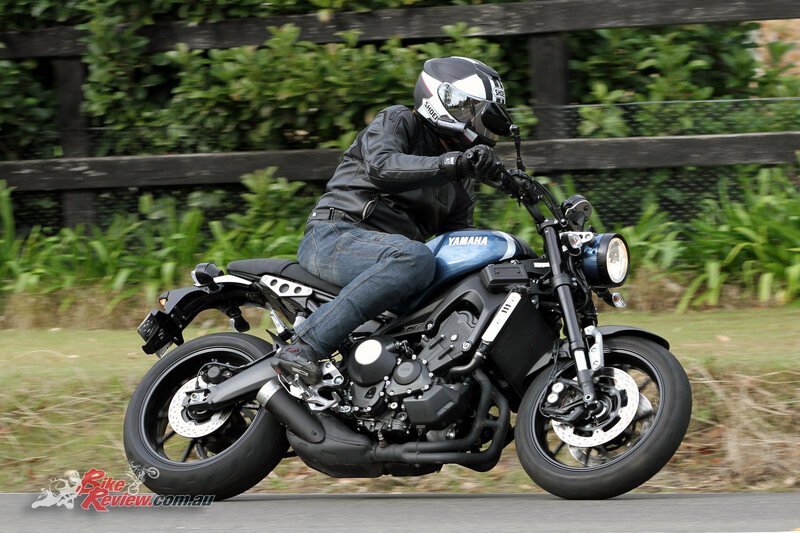 I think then the XSR could surprise many track riders. It certainly surprised me. 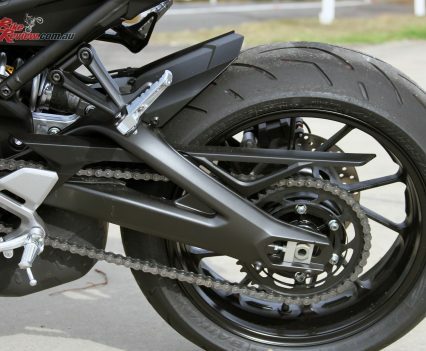 Suspension: Front: Inverted 41mm forks, rebound adjustment, 137mm travel. Rear: Link Monoshock, preload and rebound adjustment, 130mm travel. Wheels & Tyres: light alloy, 3.50 x 17in & 5.50 x 17in, Bridgestone S20 120/70 – 17, 180/55 – 17. 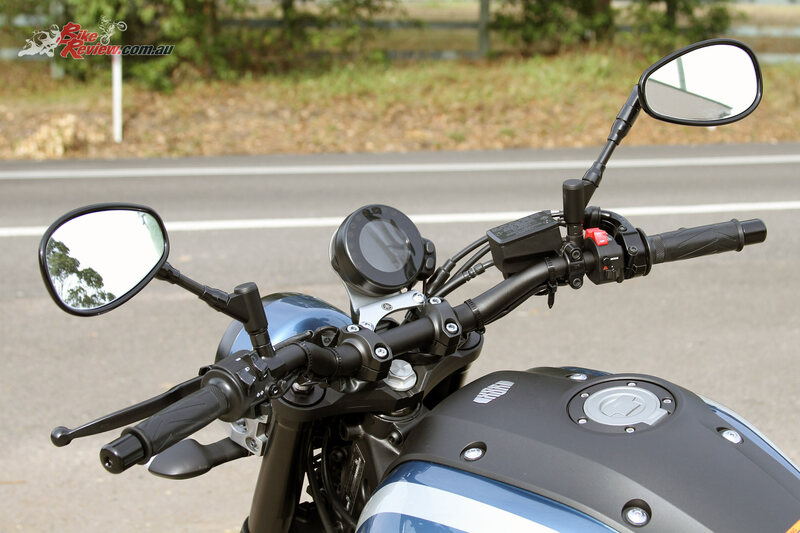 2016 Yamaha XSR900, digital dash, including tachometer (around top edge), gear indicator, idiot lights, speedo, mode and traction control readouts.